More tourists have visited Jackson Hole, Wyoming, vacation spots this season. Teton Village, Wyoming (CNN) -- At the Apres Vous chair lift, Nick Merluzzi is always quick with a smile and a greeting: "Have a good run, sir," is his sendoff to one skier. "How are you doing today?" is his greeting to the two that approach next. It is a firsthand look at one of Wyoming's leading economic indicators: Visitors to the Jackson Hole Mountain Resort, which is hoping for a rebound after big drops in consumer spending and confidence hurt business last season. "This feels good right now," Jerry Blann, the resort's president, said of the early weeks of the season. Christmas week was up from last year, and the resort says bookings for the rest of January and February also look on track to eclipse last year's numbers. "I think people have been conservative, been holding their pocketbooks pretty close for a while," Blann said. "I think they are ready to jump out." 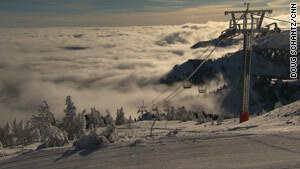 If so, it will be proof to Merluzzi, a lift operator, that a recovery is taking hold. If he is a tad skeptical, it is because of what he experienced this summer working for a local rafting company. Visits to inexpensive national parks such as Grand Teton and Yellowstone broke records this past summer, but the rafting business struggled. I think people have been conservative, been holding their pocketbooks pretty close for a while ... I think they are ready to jump out. "Going to Yellowstone was fairly easy, given the cheaper gas prices this summer," Merluzzi said. "You spend $25 and you get to camp for a week in Yellowstone, while it seemed that people were just doing that and would not spend $50 an hour on the river." This is Merluzzi's second winter at Jackson Hole. He also had an up-close look at the economic crash. 'I used to work in finance in New York City," Merluzzi said. "I lost that job around February of 2008. ... I was in global wealth management. ... I was seeing a lot of terminations and liquidations come flowing in. People just did not trust their money in stocks anymore." Now, he works at a vastly different pay scale, but he also has a very different perspective. "In this world I am not able to save any money. I am living pay check to pay check," he said. "When I was working in finance in New York City, it was, you know, It was much nicer. I was making more money; I was able to put some away. However my lifestyle there was much more stressful than it is here." His move from Wall Street to the lift line in Wyoming is in itself a sign of the times. In years past, Blann, the resort CEO, often had to apply for temporary visas for foreign workers. But not this year because of the high national unemployment rate. "This fall when we had our jobs fair, we had 500 people show up for essentially 200 jobs," Blann said. "The quality and educational capability of the people who came in the door was extraordinary. .... We are staying domestic 100 percent." There were other signs of economic turmoil that were less pleasant. The recession hit in the middle of a 10-year, $100 million capital improvement project at the resort, including a $31 million new tram to the resort's highest peak. "It is not back to where it should be, and we have got to loosen the reins a lot more," he said. Still, after a tough 2009 that forced several adjustments to the resort's budget and outlook, Blann is cautiously optimistic Jackson Hole will be part of a travel and tourism rebound in Wyoming and nationally. It is a critical slice of the Wyoming economy, responsible for nearly 31,000 jobs in the state last year and nearly 8 percent of the state's total employment. Blann says critical to any sustained recovery is applying a valuable recession lesson. "Everyone is looking for that value proposition," he said during a gondola ride to one of the peaks. "That's just natural. They're asking for deals and they are getting them." For example, Jackson Hole is offering four for the price of two air travel, or pay for three nights and receive a fourth free. One key test for Blann is whether visitors keep to the basics or choose some of the extras that add more costs to family vacations, such as lessons, time in the spa or add-ons like snowmobile tours or sleigh rides. So far this year, he sees continued evidence that even families perhaps willing to spend more than last year are still being a bit more conservative than years past. "They may not be partaking of the extraordinary other opportunities and amenities," he said. But overall, he has little doubt this winter will see at least the beginning of a rebound. "Our local metrics are the air and the lodging occupancy rate," Blann said. "And they are starting to turn positive. So we are hopeful for the season."